Some holidays are so much like all the other holidays that they run together with the other ones in a big holiday soup. It’s difficult to distinguish one from the next. This late-20th-century selfie was not from one of those holidays. I’m posing here with my brother, Tracy. This was the Thanksgiving that my half-sister, Paige, brought her daughter, Kelsey, to my mom’s house. Paige, who shares a father with me, had been to my mother’s home a few times, mostly just to pick me up for a visit at their home in East Texas. Only once or twice had she actually been in my mother’s home before. And this time she had come for Thanksgiving and brought her little girl. This foreign feeling came from the fact that we were all together…under my mother’s roof. My mother was very charming that day, shining brightly in the way that she can, where the light of who she is can fill the room where she happens to be. That is my mother when she is happy, and that was my mother on that day when my sister and niece came to Thanksgiving. My sister is 10 years younger than I am, and at that time I was beginning to struggle with whether or not I wanted to have children. I had been married for a number of years and was approaching 30. The proverbial clock was ticking, but I didn’t have that urge, that calling that so many women seemed to have. At that time, I was more infatuated with the idea of motherhood and raising a child than actually having one. My mind told me it was something I should do, that as a teacher who was married to a teacher, we were perfectly equipped for the responsibility of parenting another person. But my soul held back. It wasn’t until I spent time with Kelsey that day, that the urge started to become real for me. It was a foreign feeling for all of us to be together. It’s not that we hadn’t been together before for holidays. We had spent many holidays together—many that blur and blend into one—with our father and her mother. My stepmother’s family was always very welcoming to me. Though they weren’t my biological family, I felt cared for by them which is my main holiday memory of my times with them…that feeling of acceptance and love. I’m not sure how my sister felt about that Thanksgiving. I can only speculate that she was worried about what we would think of her, a teen-ager who had a little black child with the features of our family. But I was fascinated by this little girl. I could see my grandmother’s features and my stepmother’s features in her beautiful face. She was glorious with her dark skin and African hair. I didn’t know the story of her father. I’m sure Kelsey would want a holiday with that part of her family too and to have that feeling of acceptance. Even though that day felt so different from other holidays, in my memory now it’s one of my favorite Thanksgivings, one where people who could have easily chosen differently. Instead of choosing to hold onto past perceptions of what family is and who is welcome, we chose to accept and to love. 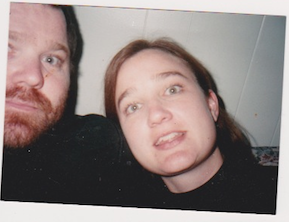 We chose to be happy; happy enough to take a late-20th-Century selfie. I want to take the feeling of that holiday with me out into the world: the feeling of even though we are not the family we expected, we belong to each other.